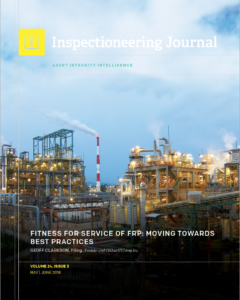 UTComp's Geoff Clarkson writes about best practices for FRP inspection in the May/June 2018 issue of Inspectioneering. A new article by Geoff Clarkson, UTComp’s founder and Chief Technical Officer, has been published in Inspectioneering Journal‘s May/June 2018 issue. Read Fitness for Service of FRP: Moving Towards Best Practices. Novel Inspection System Aligns FRP and Metallic Asset Management Approaches (May/June 2017). Non-intrusive FRP Inspection for Avoiding Premature Asset Retirement (November/December 2017).